The Coffee Taster’s Flavor Wheel has stood the test of time as one of the most influential and recognizable contributions to the coffee industry. Originally created in 1995, the wheel was designed as a base point for coffee connoisseurs and enthusiasts alike. Since the original unveiling of the wheel, the Specialty Coffee Association of America and World Coffee Research collaborated with “dozens of professional sensory panelists, scientists, coffee buyers, and roasting companies” to create the most comprehensive and holistic resource in coffee history. The wheel is as visually appealing as it is useful, providing coffee tasters a new experience when choosing and enjoying their roast. 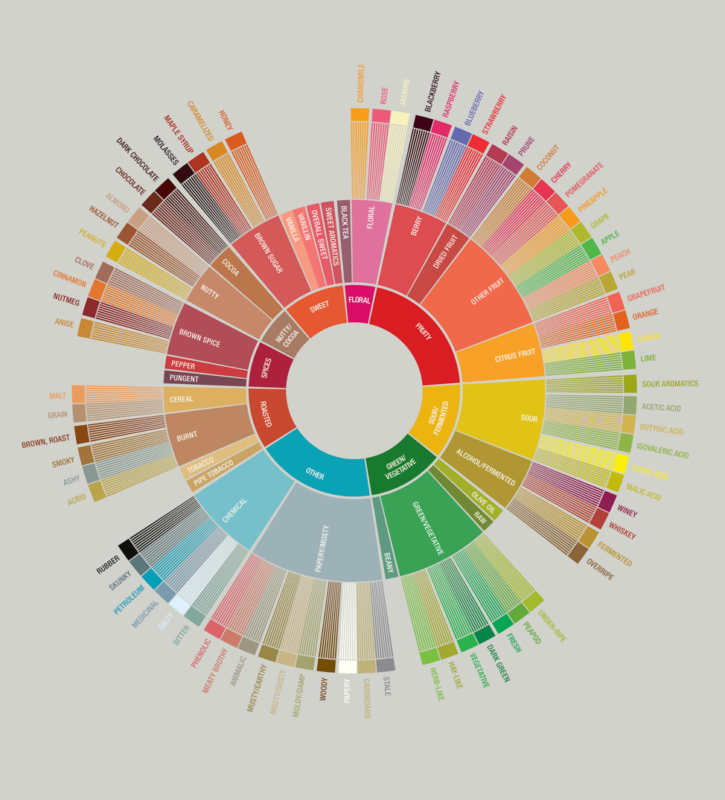 This tool is meant to allow users to better describe and analyze coffees. The Specialty Coffee Association has released a guide to using the wheel to its fullest potential with helpful tips and tricks. The first step when utilizing the wheel is to take a moment to observe the beautiful complexity coffee offers. The representation of this tool creates a visual overview of the intricacy of flavor and scent as a whole. Regardless of if you’re professionally analyzing or casually enjoying, take a moment to soak it in. Before attempting to analyze your coffee, observe the coffee at different stages in the preparation process. The aroma of the fresh ground beans, the change in fragrance after water hits, and finally the enveloping flavor just after sipping. It is important to mindfully taste and appreciate the flavor before evaluating. ‘Flavor’ is defined as a combination of taste and smell, and the flavor wheel covers both of these aspects when delving into describing based on attributes that can only be tasted versus attributes that can only be smelled. Now we begin to examine the wheel, starting at the center and working outward. The center will have general characteristics leading to more advanced, specific descriptors. Focusing on one specific flavor at a time will allow the user to form a more complete description. Begin from the center outward until you feel you have identified the distinct label, then move back to the center to zero in on another flavor. Repeat the process until you feel the description is complete. For the more advanced and thorough enthusiasts, reference The World Coffee Research Sensory Lexicon as a tool for descriptive analysis. Working along with the Flavor Wheel, start from the center again to define the attributes represented on the wheel. Each attribute has a definition and a ‘reference’, which can be used to calibrate tasters who may seek clarification on specific attributes.